Yesterday, I registered for Kathy Racoosin's 30 Day Coloring Challenge Road Trip - she's coming to Ontario in September and I can't wait! I am hoping that a few of my friends will also be able to come, and it's always fun to meet new people who have similar interests. I was so excited, I had to start colouring right away! lol! 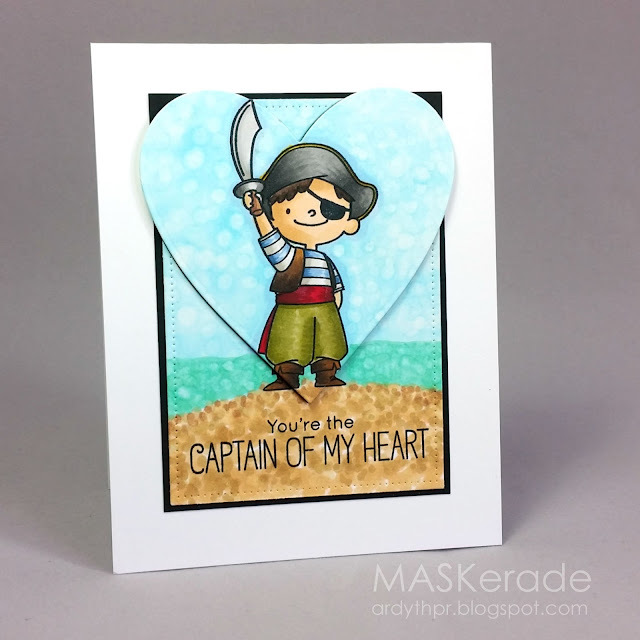 I recently got this adorable pirate set from MFT and was happy to pull it out and get it inky! I created my background using the Copic-bokeh technique that Michelle Short used (and I copied shamelessly) last week. I think it will be a long time before I get tired of this technique - I love the look! I cut out the heart and then from the remainder of the panel, I cut a pierced rectangle. The whole thing is very simply mounted on a white card base. Oh, this is so cute and fun. What a fab colouring technique. It looks amazing. I'm not good at this sort of stuff, but I need to hunt down how to do this. How gorgeous is this cute pirate and how you have coloured and mounted him Ardyth. Love the caption too. Too darn cute...love your sweet pirate! darling, and the design is fabulous. WOndeful coloring. Nice card Ardyth! Your colouring is way better than mine. I just signed up for Kathy's road trip too! Will you be there on the Saturday or Sunday? There were only a few spots left so I could only get in on Sunday.